A metal inert gas (MIG) welder uses a semi-automatic arc welding process in which a continuous welding wire is fed through the welding gun, forming a weld. One of the most common problems with an MIG welder is the welding wire becoming stuck in the welding gun. 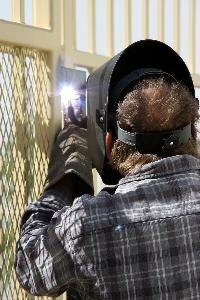 When the welding wire becomes stuck, you must remove it or the welding gun can be damaged. Removing the welding wire from the welding gun is a quick process, so you can get back to welding in no time. Turn the MIG welder to the "Off" position. Grasp the stuck welding wire with the pliers and pull it out of the welding gun. Grab the welding wire from the point where it enters the welding gun. Inspect the roll of welding wire. Check for imperfections on the welding wire like bends, twists and rust. Cut the damaged section off the welding wire with the wire cutter. This will help prevent the welding wire from becoming stuck again.